Learn to read and spell some new words with a word search! This one has words that you find in the city. As your child searches for each word in the jumble, ask him to give a definition in his own words. This word search is all about owls! Your child will learn a few different species of owl as he looks for them in the word search. Get familiar with different kinds of poetry with this poetry word search. 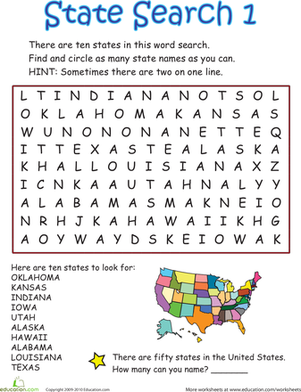 This poetry word search has your kid honing his spelling and observation skills. It's a word search celebration! See how many birthday words your child can find in this word search. He'll practice spelling as he hunts for each one. Find presidential and historical words in this election-themed word search. Help tide your child over until Christmas with this yuletide word search. It's a pirate word search, perfect for your budding buccaneer. Keep your child occupied on the ride to the lake with this fishing word search. 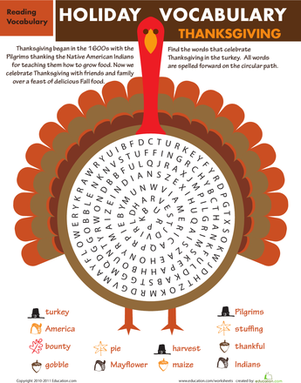 Challenge your kid to search for and find the hidden Thanksgiving-themed words in this fun word search! Help your child expand his vocabulary with this circus word search. Get to know different sports and how to spell them with this fun printable word search.